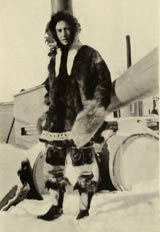 One of the more unusual family names among the Inuit and Inuvialuit of the western and central Arctic is Klengenberg. This large extended family traces it origin to Christian Klengenberg, a Danish sailor born in 1869. In 1893 Klengenberg made his first trip into the Arctic as cook onboard the whaling ship the Mary D. Hume. He jumped ship in Alaska, married an Alaskan Eskimo, and for the next eleven years lived with her people on the north coast of Alaska. Klengenberg's dream was to establish trading posts east of the Mackenzie Delta in an area where no trading post existed but could never scrape together enough money to buy the necessary trade goods. In 1905 Klengenberg was hired as the skipper of the whaling ship Olga and was to spend the summer hunting whales north of the Mackenzie Delta. The Olga disappeared in dense fog and was believed to have sunk. In the summer of 1906 the ship showed up at Herschel Island (map) with Christian Klengenberg claiming he had ‘borrowed’ the ship to “search for a lost tribe of Inuit” east of the Mackenzie Delta. When the Olga arrived back at Herschel Island in 1906 there were four missing crewmembers. Klengenberg claimed that he was forced to defend himself during a fight and had to shoot one crewmember, another died from scurvy and the remaining two were lost while out hunting. The crew backed up his story but only while Klengenberg was present, the story each crewmember gave when questioned alone was quite different. The story they now told was that one crewmember was shot by Klengenberg when he protested the take over of the ship, another died of starvation when he was chained up in the hold and the remaining two crew, who where the only witnesses to the shooting, were abandoned by the Olga when they went on a hunting trip! Based on these statements the Northwest Mounted Police stationed at Herschel Island issued a warrant for his arrest but he had slipped away and had headed for Alaska, out of reach of the Canadian police. Charges of murder were eventually also filed by the American officials but it took years for them to catch up with him in Alaska. Christian Klengenberg was returned to San Francisco and put on trial for murder and to everyone’s surprise was found not guilty due to a lack of evidence. He returned to the Arctic and established trading posts in the central and western arctic where many of his descendants still reside today.